Wigan Athletic’s proud unbeaten home record has gone, with Leeds United spoiling Dave Whelan and David Sharpe’s grand farewell by winning 2-1 at the DW Stadium. But everything else about the day underlined how special the Latics family is - which new owners International Entertainment Corporation will surely have already recognised from afar. Latics couldn’t have got off to a better start, with England junior international Reece James curling home a brilliant free-kick inside six minutes. But Leeds were level within three minutes when Pablo Hernandez slotted past Christian Walton after good work from Mateusz Klich. The home side would have been happy to go into the break on level terms, with Leeds enjoying more and more of the ball in good areas. But Latics fell behind within 39 seconds of the restart, when a mix-up between Walton and Cedric Kipre allowed the lively Kemar Roofe to walk the ball into an unguarded net. And Hernandez almost made it 3-1, only to hit the post for Leeds in stoppage-time. At the other end, substitute Callum McManaman sent a curling shot just over with Wigan’s best chance of the second half. But Paul Cook can have few complaints on the whole with his side - missing all four first-choice forwards - understandably lacking a cutting edge in front of goal. The Latics boss had raised a few eyebrows pre-match with his team selection, bringing back Cedric Kipre for Chey Dunkley at the heart of the defence and preferring Darron Gibson - back from a three-match ban - to Lee Evans alongside Sam Morsy in the engine room. But he couldn’t have dreamed of a better start to proceedings. Joe Garner was clattered by Liam Cooper 30 yards from goal, and Jame stepped up to curl the ball over the wall and beyond the despairing dive of Bailey Peacock-Farrell. Unfortunately, Latics couldn’t consolidate their lead, and Leeds were level within three minutes through Hernandez. The visitors then dominated, with former Latics midfielder Adam Forshaw pulling the strings in midfield. Walton was forced into a brilliant save to deny Forshaw, with the Latics goalkeeper then doing well to diffuse a speculative cross-shot from Ezgjan Alioski that may or may not have been curling into the top corner. Roofe was inches away from finishing off some good work from Hernandez, and Latics would have been pleased to reach the break without further punishment. However, that was to change within 39 seconds of he restart, when an awful mix-up between Kipre and Walton allowed Roofe the easiest of finishes to put United 2-1 ahead. Leeds visibly grew in confidence after going ahead and - inspired by Forshaw - were playing some lovely football, without testing Latics enough in the final third. 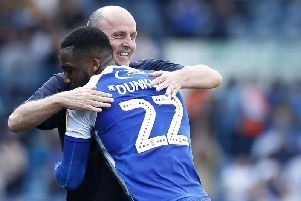 Cook did everything he could to change things, sending on McManaman, Leo Da Silva Lopes - for his league debut - and James Vaughan in the last half-hour. Da Silva Lopes showed some promising touches, while McManaman almost found a late equaliser, chopping inside the Leeds cover only to send his shot inches over the crossbar with Peacock-Farrell not getting there. As Latics pushed forward, Hernandez almost make it 3-1 in stoppage-time, only to hit the far post after a wonderful backheel by Forshaw. Substitute Jason Shackleton should have converted the rebound, but he somehow side-footed wide of the target.